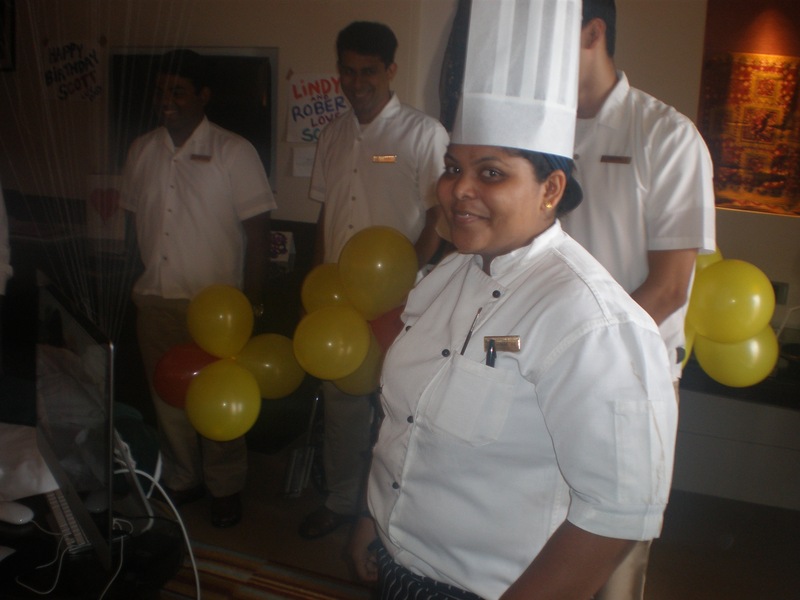 There are very few female chefs in India. The Goa Marriott has two. Chef Samantha is one of them. Sam’s award winning cake design captured a roulette wheel perfectly for Scott’s birthday party. Most mornings Sam and colleague Chef Pradeep come over to my breakfast table to say hello. Makes all the difference in the world to see a friendly face when you’re far from home. Pradeep is very solicitous of Scott’s special dietary needs and more than once has called me to doublecheck if something is okay for Scott to eat. Sam is the go-to girl for liquid chocolate cookies right out of the oven when you’ve got a chocolate jones going on. Which is like, always. This entry was posted in Uncategorized and tagged chefs in india, Going to Goa Blog, Katy Allgeyer, marriott hotel, Scott Morgan, traveling with cancer, women chefs. Bookmark the permalink.